Interest in macroscopic cables consisting of assembled nanofibers has recently increased in the field of materials science and synthetic chemistry. We demonstrated that the nanofibers in the cables was able to be oriented parallel or perpendicular to the longitudinal axis by regulating the fluidic velocities of the core and sheath flows in coaxial microfluidic devices (nanofiber is a fibrous material with nanometer size, nanometer = 0.000000001 meter). These controlled cables exhibit a remarkable difference in their electrical conductivity and also mechanical properties that depend on their morphology. As our study considers only the fluid flow of nanofiber suspensions, this method is applicable to a variety of anisotropic materials such as fibers and tubes, and can be used to enhance the resultant physicochemical properties. Supramolecular self-assembly is important in biology and materials science as a functional elements in tiny (nanometer-to-micrometer) scales. It is generally difficult to construct macroscopic supramolecular structures, as the interactions between constructing elements are too weak. We demonstrate a method to fabricate meter-long supramolecular strands by encapsulating them in robust polymer gels using a microfluidic channel. The strands are self-assembled and aligned under the laminar flow conditions. Their mechanical strength was sufficiently high to allow their patterning onto a substrate, bridging between pillars on a centimeter scale, and use as reaction vessels for synthesizing an insoluble polymer. 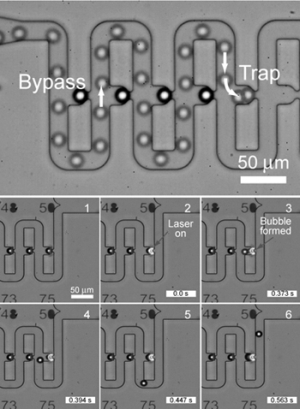 This simple technique demonstrates a universal approach for fabricating and utilizing macroscopically aligned supramolecular materials for future technological applications such as on-demand printing of organic electric circuits and flexible sensors. We believe that this approach represents a major advance in the realization of large-scale supramolecular structures with defined shapes, including one-dimensional coils, two-dimensional fabric sheets, and three-dimensional constructs. This paper describes a method for high resolution and selective patterning of proteins using a patterned parylene film and PDMS microchannels. Solutions containing desired materials are delivered through the microchannels to the patterning spots where the parylene film is perforated in a desired pattern. Proteins are patterned on a planar substrate after being immobilized on the spots, and subsequently both the PDMS and parylene layers are peeled off. Using this method, fine patterns of bovine serum albumin (BSA) in arrays of 20 μm × 20 μm spots at 2 μm intervals were achieved. 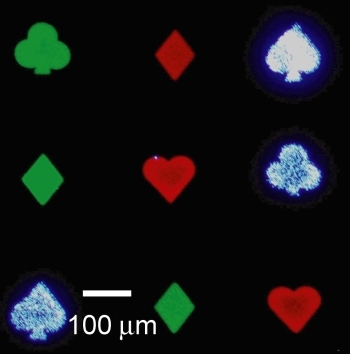 Selective patterning of multiple fluorescent beads was also demonstrated. This method can be performed under the wet condition, which prevents the drying out of proteins and is useful for selective protein patterning with minimal nonspecific binding on the undesired area. This paper describes an electrofusion device for controlling the precise moment of fusion between droplets by applying an electric field. This device allows (i) accurate determination of the start of chemical/biological reactions, (ii) minimum contact of reactants with channel walls–eliminating surface absorption problems, (iii) easy fabrication and (iv) continuous observation of initiated reaction. We demonstrated the fusion of beta-galactosidase and fluorescein di-beta-D-galactopyranoside (FDG) droplets, and observed the enzymatic reaction using fluorescence microscopy. In addition, sequential fusion of pico-litre droplets was also accomplished.